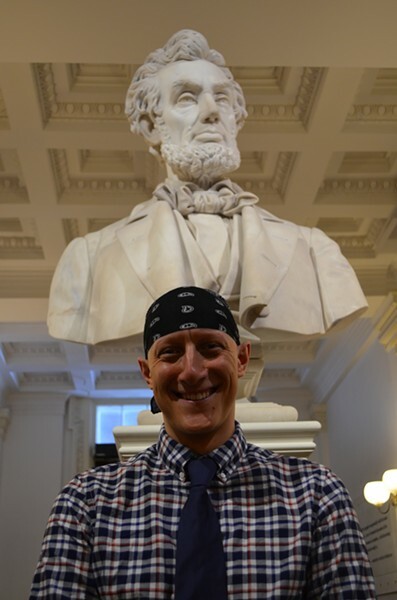 Ben Sarle stands in front of a statue of Abraham Lincoln at the Statehouse Tuesday. Thread Magazine, Burlington's two-and-a-half-year-old arts and culture publication, has a history of serving as a mouthpiece for the Vermont Democratic Party. It has regularly featured Democratic candidates — and only Democratic candidates — on its news pages. It threw a campaign party for then-mayoral candidate Miro Weinberger days before his 2012 election. And it's invited readers to fundraisers for the Burlington Democratic Party and Planned Parenthood. Now the connection is official. The VDP announced Tuesday that it's hired Thread's founder and publisher, Ben Sarle, as its new communications director. Sarle, a former freelance photographer for the Burlington Free Press, replaces Ryan Emerson, who stepped down in January to run for a Burlington City Council seat. "He's extremely qualified. He's really familiar with Vermont and Vermont politics. He has a wealth of knowledge and skills when it comes to the press and the issues," explains VDP executive director Julia Barnes. "And I also think he's great at new media and new, digital ways of communicating. That's important to us." Says Sarle, "I'm excited to sink my teeth in ... I think it's going to be an awesome year. We're really excited. We have some really strong candidates, and I'm ready to go." So what does this mean for Thread, which became an online-only publication last September? "Thread right now is going to be on hiatus," Sarle says. "I won't have any editorial part in Thread anymore. And, to be announced, it will be taken over by someone else soon." Sarle wouldn't divulge any more details of the mag's future, but said he was done with it, "Because it's kind of a conflict of interest." According to Barnes, the party insisted on Sarle severing his ties with the publication as a condition of employment. As for his decision to leave publishing for politics, Sarle says, "It's not even that much of a switch," noting that he's "kind of been on the periphery" of Democratic politics for some time. While serving as publisher of Thread, Sarle did freelance social media and photography work for both the city and state parties. Last September, he was elected Ward 2 chairman of the city party. "So I've been doing this for a long time. I just haven't had a full-time position in politics," he says.